The study led by Ghasideh Pourhashem, a postdoctoral fellow at Rice's Baker Institute for Public Policy, appears in the American Chemical Society journal Environmental Science and Technology. "Our model projections show health care cost savings could be on the order of millions of dollars per year for some urban counties next to farmland," Pourhashem said. "These results are now ready to be tested by measuring changes in air pollutants from specific agricultural regions." "We know that biochar impacts the soil nitrogen cycle, and that's how it reduces nitrous oxide," said Masiello, a professor of Earth, environmental and planetary science. "It likely reduces NO in the same way. We think the local impact of biochar-driven NO reductions could be very important." The Rice team used data from three studies of NO emissions from soil in Indonesia and Zambia, Europe and China. 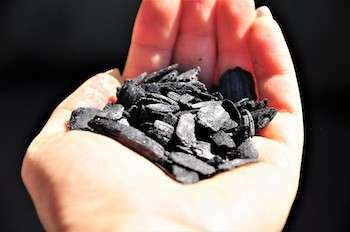 The data revealed a wide range of NO emission curtailment—from 0 percent to 67 percent—depending on soil type, meteorological conditions and the chemical properties of biochar used. Using the higher figure in their calculations, they determined that a 67 percent reduction in NO emissions in the United States could reduce annual health impacts of agricultural air pollution by up to $660 million. Savings through the reduction of airborne particulate matter—to which NO contributes—could be 10 times larger than those from ozone reduction, they wrote. "Agriculture rarely gets considered for air pollution control strategies," said Cohan, an associate professor of civil and environmental engineering. "Our work shows that modest changes to farming practices can benefit the air and soil too."